New Years Eve is upon us so I thought I’d bring a little sparkle and shine to today’s post. 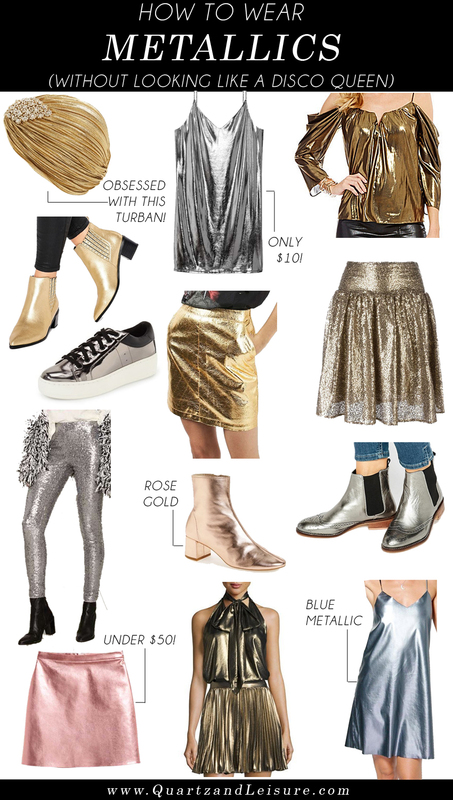 It’s all about how to wear metallic! 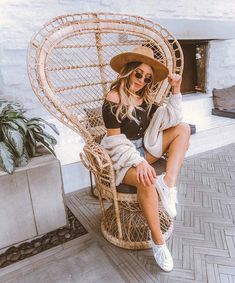 If you haven’t been too sure on how to pull off this look in the past, hopefully these tips will help you achieve the look, without looking like you stepped out of a 1975 disco inferno. If you’re timid about wearing metallics, I would start with wearing just a hint of it in your look. For example, you could wear a metallic shoe or boot that will spice up an otherwise ordinary outfit. Or maybe a metallic neck scarf such as this one? Or why not try a metallic skirt like as seen here or here? 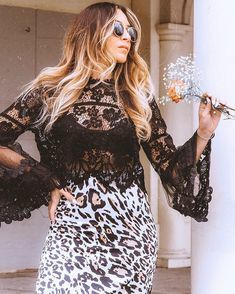 You can pair these with a band tee and moto jacket for a more casual vibe, or dress it up with a fancier sheer blouse and heels for date night. If you’re feeling a bit bolder, you can add a colored metallic to your look, such as this pink metallic skirt and this light blue metallic slip dress (on sale now for only $18!). Pair the dress with a white tee underneath for a perfectly 90’s it-girl vibe. And, as always, I’m obsessed with anything rose gold, so these booties are perfect! Just the right amount of a soft pinkish rose. If silver is more your style, this silver metallic top is on sale right now for only $10! Pair it with some ripped black jeans or leather moto pants for a rocker chic vibe. I am also pretty obsessed with this gold turban, although I would reserve this item for those who are very confident with their metallic looks. 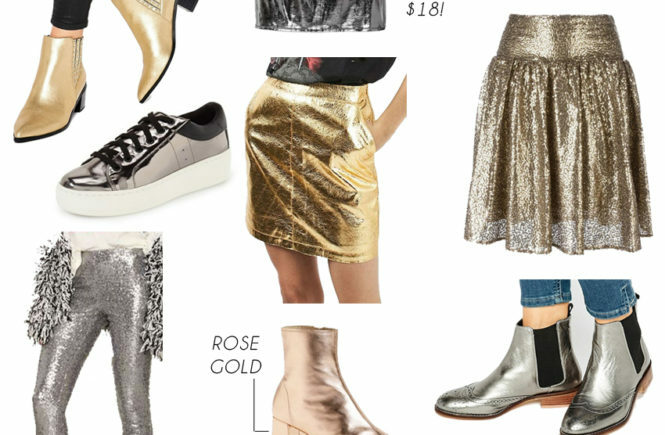 Do you have any other tips on how to wear metallic? And what are you all wearing for NYE? !